Dubai: Authorities in Al Ain are cracking down against illegal street vendors who sell rotten food to customers for a fraction of the original cost. 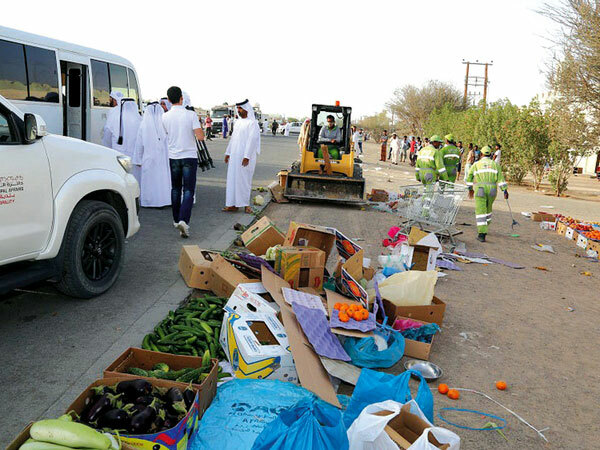 The Department of Inspection of Al Ain Municipality’s eastern sector said it carried a raid with Abu Dhabi’s waste management centre Tadweer, as well as with the cooperation of Al Ain Police. Ahmad Al Hammoudi, a municipality official who helped organise the raid, said that authorities carry out anywhere from six to 10 such types of campaigns per year. “In our last inspection, we issued 41 fines that carried a penalty of no less than Dh1,000,”said Al Hammoudi . “We discovered that there were street vendors who were selling food that were harmful for human consumption. In total, we seized 16 tons of harmful goods, which included rotten meat, vegetables and fruits. The food was then confiscated by Tadweer and destroyed at their recycling centre,” he said. The majority of the street vendors are infiltrators or people who stay in the country illegally, and sell their products in narrow districts, near homes and worker accommodations.